I'm slowly working on the master bedroom and adding the things I love bit by bit. So far we're covered when it comes to a headboard, bedside tables, lamps and a few accessories, but we're in dire need of proper bedding. Currently we have a white Queen size duvet on our king size bed. Not cool. I'm dying to add a bit of colour because it's quite neutral at the moment. 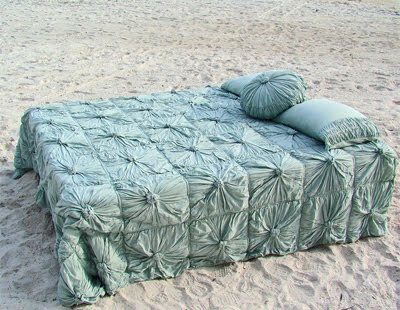 I came across this beautiful comforter by Lazybones and now I am dead set on adorning our bed with this comforter in the perfect shade of blue-green. I am completely obsessed with this Duck Egg colour, but of course it's currently out of stock. If Duck Egg doesn't appear to be available anytime soon, I might settle for the equally gorgeous creamy comforter in Organic. The lovely rosette texture more than makes up for what it lacks in colour.